A Puppy Dog Birthday Party conjures up the most adorable images! I have a soft spot for wiggly, little guys and their doggies. If you do too, this is the perfect party theme for you! Cristy, at Pretty My Party, pulled together darling puppy party supplies. You’ll find all manner of treats on the doggie themed dessert table, including a polka-dotted, party-hat wearing puppy on the cupcakes. The winsome grin on this little image makes you want to grin right back! In fact, I’m sure any small fellow would be grinning through this entire party, from the yummy treats to the unique “Adopt a Puppy” party favors to take home. Check out the amazing details in A Creative Boy’s Puppy Themed Birthday Party. 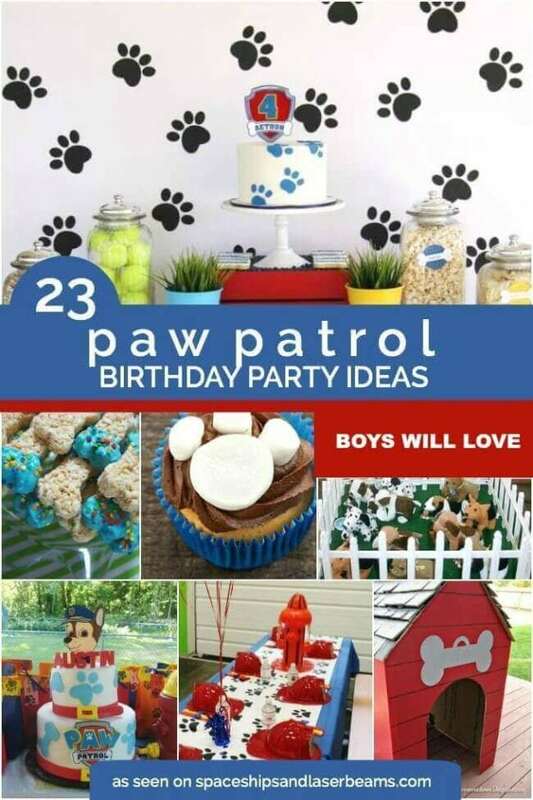 Plan A Dog Themed Second Birthday Party that they will love. A masculine duo of blues is punched up with a cheerful dash of red throughout the party decorations. Look closely and youll find stripes, dots and paw print decorations everywhere! and a cute puppy tops it off. Other treats are cleverly disguised as dog food: Pup Corn ( popcorn–in boy blue, no less! ), Puppy Chow (Chex Mix dessert), and Lollipups (chocolate suckers). And no mom would ever mind finding the Oreo “paw prints” on the table! The “Pup Cakes” are real attention getters with their jaunty displays of puppies, dog bones and paw prints. Dogs and their bones appear again on the cake pops, too. Blue punch beverages, served in Mason jars (with lids, no spills?! ), sport decorative paw prints and a tiny straw flag encourages Enjoy! A red bucket, labeled with “Wipe Your Paws”, holds napkins. Seating table centerpieces are medallions of the theme puppy, a doghouse and the number 2 anchored in red buckets. Dog bone and balloon confetti is scattered on the tables. I think my favorite detail of the party is the darling party favors! Blue and Red buckets hold coloring books, crayons, bubbles and small, stuffed dogs which come with their very own “Adopt a Puppy” certificate! What boy wouldn’t go home with a heart full of glad after being at such a fun party?! Check out more parties perfect for puppy lovers.